Last night Chikara Shotokan Karate Academy unveiled their New Squad Jackets for 2013. These will be worn by members of the CSKA who compete or attend demonstrations representing the club. 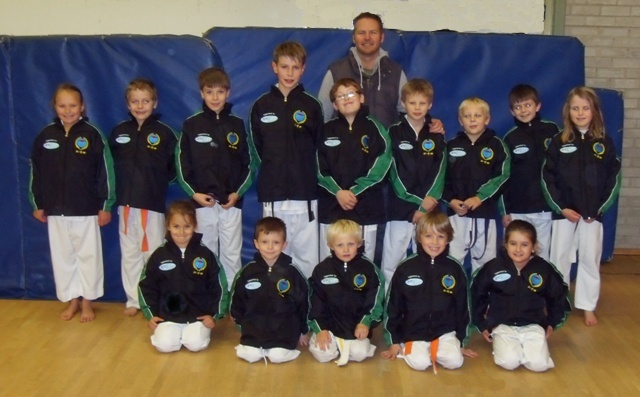 The jackets were kindly sponsored by AeroCare International Ltd.
Pictured: Kevin Waud – Sales & Commercial Director for AeroCare International Ltd with members of the CSKA Hawarden Dojo trying out the new jackets for size. The CSKA would like to thank both Kevin & Aerocare International for their kind gesture and support for the club.